Unit 11 is a mobile residency that focuses on transmission based research and practice. 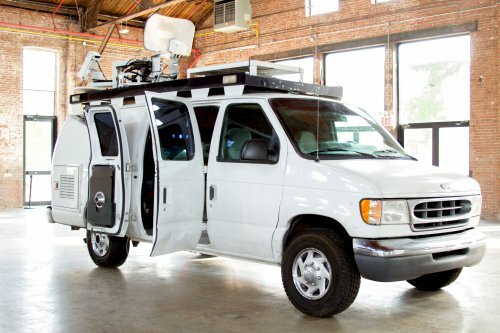 The residency, named after its former ID-tag for Austin Channel 8 News, is a studio-on-wheels that engages in site-specific transmission based projects with other artists, technological innovators, scientists, and engineers. Collaborations with colleagues in creative and technical realms will assist in the studio buildout for Unit 11. To date, Unit 11 has been fully outfitted for live video mixing and broadcast using both analog and digital media. Unit 11 hopes to be a mobile studio that will be self sufficient as well as energy conscious. The residents that work within the van in specific sites are chosen for their expertise, ingenuity, and dedication to alternative means of theory and practice. Site/Phase One was launched in April 2016 with artist, Ed Bear from the host location of Pioneer Works in Red Hook, Brooklyn. For his residency, Bear has installed a new iteration of the radioOrgan, a hand-crafted modular FM transmission system built from obsolete electronics, inESPTV‘s Unit 11 mobile studio. The residency culminates in a live performance from the van at Pioneer Works with live radio broadcast recording via Clocktower Radio. The first live performance event features Ed Bear, Emilie Mouchous, Jaiko Suzuki and Benoit, Joe DeNardo (Growing) and Ben Greenberg. Residents are selected by E.S.P. TV Directors, Victoria Keddie and Scott Kiernan. This project was launched with the support of a Franklin Furnace Grant, 2015. Unit 11 Residency in partnership with Clocktower Radio, Pioneer Works, Brooklyn, NY.